The male of this medium sized butterfly is easily recognised by the distinctive, vivid orange tips to the top of its otherwise white forewing - looking almost as if its wings had been dipped in orange paint. There is also a dark spot close to where the orange and white colouring meet. The undersides of the wings, on the other hand, are mottled green and white, creating a superb camouflage when settled on flowerheads such as Cow Parsley and Garlic Mustard. Looked at closely, the green colour is in fact made up of a mixture of black and yellow scales. The male is able to hide his orange tips by tucking the forewings behind the hindwings at rest. 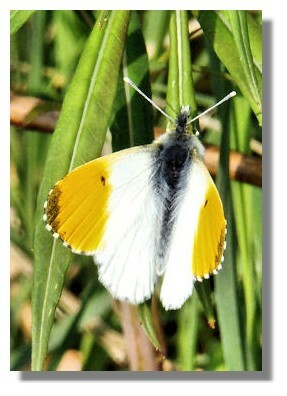 The Orange Tip is found across Europe, and eastwards into temperate Asia as far as Japan. Over the past 25/30 years there has been a rapid increase in the range of the Orange Tip in the UK - particularly in Scotland. It is now found in many parts of Scotland, as far north as Moray, flying along hedgerows and damp meadows, damp pastures and meadows, damp woodland edges and glades, riverbanks, ditches, dykes, fens, railway cuttings and country lanes. 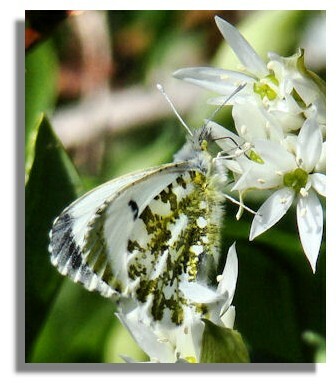 The Orange Tip is usually seen in damp grassy habitats where Cuckooflower (also known as Lady's Smock) the primary larvae foodplant grows and along hedgerows where Garlic or Hedge Mustard is found. 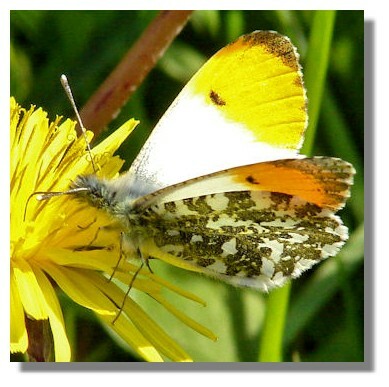 The more reclusive female Orange Tip lacks the orange marking, having black wing tips instead and is often mistaken for one of the other 'White' butterflies. 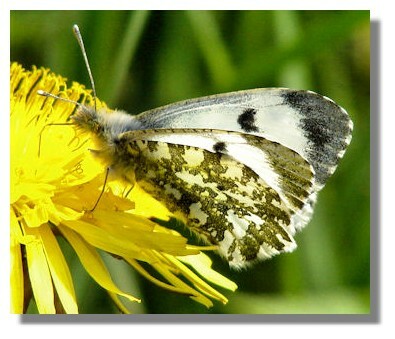 However, it has a mottled green and white underside similar to the male. See graphics above and to the left. or go to the next Butterfly: Painted Lady.